Prepare the breadcrumbs Preheat the oven to 350 degrees F. Place the bread in a food processor and process until fine crumbs form, 25 to 30 seconds. Place the crumbs on a baking sheet, spreading them evenly. Bake until golden brown, about 8 to 10 minutes. Prepare the poppers Spray a baking sheet with nonstick spray. In a small bowl, stir together the cheeses and parsley. 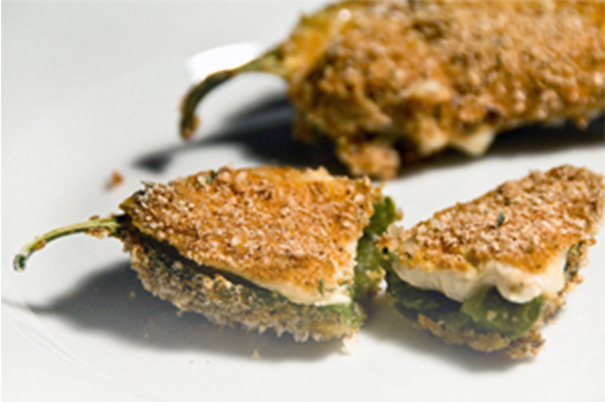 Fill each jalapeño half with 2 teaspoons of the cheese mixture. On a plate, combine the flour, 1/4 teaspoon of the salt, and 1/8 teaspoon of the black pepper. In a small bowl, beat together the egg and the water to combine. On another plate, combine 1 cup of the bread crumbs, the remaining 1/4 teaspoon salt, the remaining 1/8 teaspoon black pepper, the paprika, garlic powder and cayenne pepper. Dip each jalapeño half in the flour, shaking off the excess, then in the egg wash, and finally in the bread crumb mixture, shaking off the excess. Place the coated jalapeños, cut-side-up, onto the prepared baking sheet and spray lightly to coat with cooking spray. Bake until golden brown and crisp and the cheese has melted, about 30 minutes.